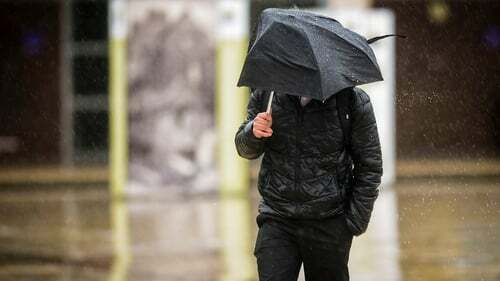 A 24-hour status orange rainfall warning is in effect for Cork and Waterford, while status yellow rain and wind warnings are in place for other counties. Met Éireann has warned of hazardous driving conditions during the orange weather alert, which is in place from 6pm this evening until 6pm tomorrow. It says that rainfall amounts will be highest along the south coast and higher ground. From 6pm this evening until 6pm tomorrow, a status yellow rainfall warning is in place for Kilkenny, Wexford, Kerry, Limerick and Tipperary. Met Éireann says there is a risk of spot flooding, especially in southern parts of these counties. Meanwhile, a Status Yellow wind warning is in place from 2am tomorrow for southeast and western counties. The alert for Donegal, Galway, Mayo, Cork and Kerry, is valid until 7pm tomorrow night. A separate Status Yellow wind warning has been issued for counties Dublin, Carlow, Kildare, Kilkenny, Laois, Wexford, Wicklow, Offaly, Leitrim, Roscommon, Sligo, Clare, Limerick, Tipperary and Waterford. Met Éireann says this weather alert is in place from 5am tomorrow until 5pm. Click here for live weather information and a full 7-day forecast for your area.